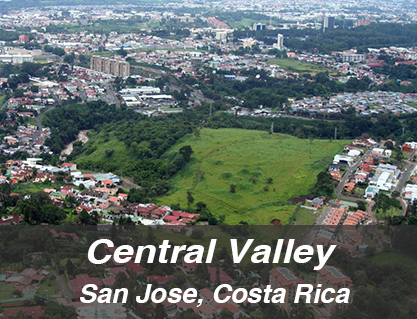 The Central Valley is a large and fertile land surrounded by mountains. 70 % of the country’s population resides here. If you explore these highlands you will experience many diverse micro climates. There are several volcanoes in the area that are visited by thousands of tourists each year, as well historical monuments in the capital city including but not limited to theaters, museums and governmental institutions. One can get around the metropolitan area with relative ease due to the extensive network of buses, taxis, and a limited rail system. The Northern Lowlands are known for their picturesque villages that welcome many tourists year round. 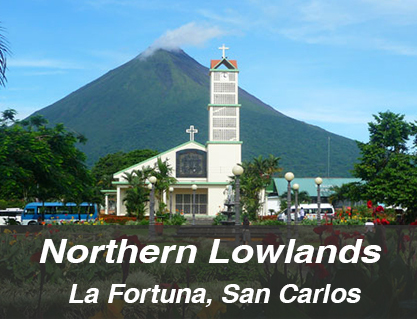 The small town of La Fortuna, is a favorite among visitors due to its proximity to the Arenal Volcano (about 6 km). There are several hotels, such as the Arenal Volcano Inn, as well as restaurants and bars, tourist attractions like canopy, suspension bridges and hiking areas and more, in the area. The La Fortuna Waterfall is a must, rising 70 meters from the base, surrounded by several natural pools. There are amazing hot springs as well, for those looking for a more relaxing adventure. 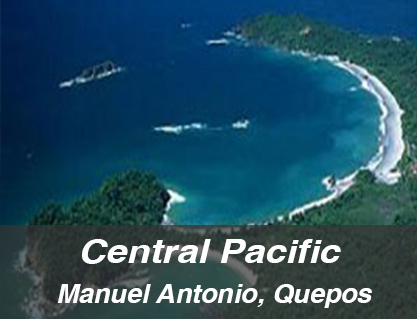 The Central Pacific extends across the Pacific Coast, from Guanacaste to the border of Panama. The Central Pacific region has a climate that is both dry and wet dependent on area. Tourists may visit the United Fruit Company banana port, on their way to Manuel Antonio, in Quepos. There are several well priced hotels and cabins in the Quepos area. 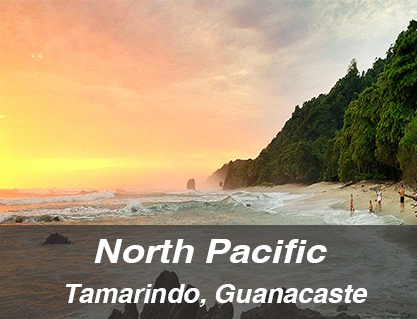 The North Pacific has some of the most spectacular and unique beaches in the country. The peninsula’s highlights are Flamingo Beach, Playa Conchal, Playa Tamarindo, Black Beach and Playa Avellanas. In the South Eastern side of the peninsula, Montezuma and Flamingo Beach are the most visited spots. There are several luxurious homes and hotels in the area with much to see and experience. This area for the most part, is very quiet and tranquil with lots of sport fishing and surfing. The Caribbean Coast is where the Caribbean Sea and the rainforest come together. There are several white sand beaches and clear crystalline waters. Around a quarter of the Caribbean coast is protected. The Caribbean coast is less frequented than the Pacific due to its precipitous climate. 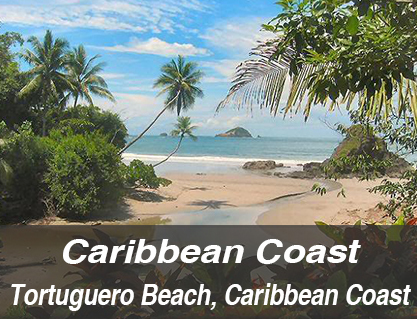 Numerous indigenous communities inhabit the Caribbean Coast including the Cocles, Bribrís Talamanca and Cabécar, as well as a large Afro-Caribbean population. 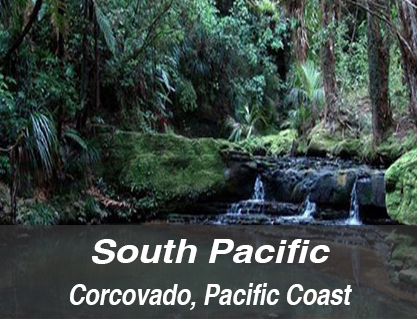 The South Pacific is a fundamental part of Costa Rica’s geography in terms of biodiversity due to its maritime topography. The Osa Peninsula and the Nicoya Peninsula are two very important peninsulas in the region. Osa is located in the southern province of Puntarenas. Despite being a relatively small area in terms of land mass, there are a large number of tropical habitats: rain forests, coastal wetlands, mountain forests, among others. So go ahead and find out more, and experience the beauty and wonder that is Costa Rica.